A good quality sofa is an investment which, if treated correctly, should last for years. My friend’s mother has a pair of sofas which she bought in 1973. She’s had them recovered once but considering they are 43 years old and have gone through two kids, five grandkids, and multiple house moves over the decades, they are in superb condition. Part of the secret was buying a good quality item, but the rest of it is down to how she took care of them. Leather is a fantastic choice for sofas. It’s durable, easy to clean, and looks even better as it ages. Aniline leather is the most expensive type of leather for furniture as it feels soft yet is very tough. Semi-aniline leather has been treated with a pigmented coating that has some stain protection, while pigmented leather is the most durable choice as it has a polymer coating which helps prevent scratches, fading, and stains. Vinyl looks like leather. It is inexpensive and easy to clean although it is not as comfortable as cloth or leather to sit on, especially in hot weather. Fabric sofas are a less expensive alternative to leather. While they tend not to last as long they do have other benefits. Polycotton covers work well for families as the synthetic content is not prone to wrinkling or fading. Microfibre feels a lot more luxurious than its price suggests and is good for allergy sufferers but it can stain quickly. Removable cotton sofa covers can easily be washed and dyed however they crease easily and do not last long in comparison with other fabrics. Any fabric in direct sunlight will fade over time, so position your couch away from a window if possible. Push back and plump up cushions every day or two, vacuum weekly (especially the cracks between cushions where crumbs gather), and clean off any marks as soon as you notice them. You should rotate your seat cushions every month, and treat leather sofas to a conditioning treatment every six months or so. Fabric sofas should get an annual clean – either by washing the covers as per the instructions, or getting a professional in to clean it for you. No matter how careful you are it is highly likely someone will spill something on your sofa at some point. Don’t panic when this happens. Just blot the stain with a damp cloth (cool water, to avoid setting the stain) then treat with the appropriate upholstery cleaner. The biggest threats to your couch will be kids and pets. The former will always bounce, flop, and throw themselves on it, so choose a sofa that feels sturdy enough to withstand the onslaught. The latter will shed hair and scratch. Foam cushions are the firmest to sit on. They hold their shape better than fibre or feathers and require little maintenance but you will still have to instigate some no-jumping rules if you want it to last the way it should. If they want to jump, buy a trampoline. Whether you’ve used cleaners in the past or this is the first time you’re considering getting someone in, here are ten questions you should always ask a potential new cleaner. 1. How are your rates charged? All cleaners have different pricing structures. Some charge by the job regardless of how long it takes, while others charge per hour. Speak with several cleaners to get quotes to find out which is the best for you and remember that the cheapest cleaner is not always the best. 2. What is included in the price? How many cleaners does that price include? What tasks can I expect to be done in the agreed time, and what happens if they are unable to complete them in the expected time? Your cleaner should be happy to provide you with a checklist of agreed tasks you are paying for. Just because someone has only recently started up a cleaning business does not mean they can’t do a great job, but they should have sufficient experience and knowledge for cleaning your surfaces, especially if you have expensive finishes and furnishes which could easily be damaged without the right care. Hiring a cleaner is the same as interviewing for another job, and no savvy employer would hire someone without first checking their references. 5. Will it be you, or an employee who cleans my property? This is a big one as you want to know who will be in your home. If the person you’re speaking to won’t be the one cleaning your home who will be, and what sort of background check has their employer done? 6. Do you have liability insurance and bond? 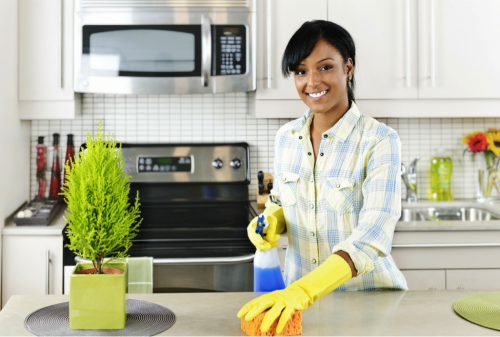 Your cleaner should have liability insurance to cover any damage or accidents at your property. 7. What equipment do you supply? Some cleaning companies bring everything they need, while others prefer their clients to supply the materials and equipment. This should also be reflected in the cost. If you have preferred products let your cleaner know, and if you’re providing the equipment make sure your cleaner is happy with them and knows how to use them. 8. How will you gain access? The security of your home is paramount. Agree with your cleaner how they will gain access and make sure it is a way that both of you are happy with. 9. Can I have a written contract? Ask your cleaner for whatever you have agreed on in terms of hours, equipment, tasks, property access, insurance, etc. to be put in writing for both of you to sign. This is as much for their protection as for yours. 10. What happens if I am not happy? You need to trust your cleaner will treat your home with care and respect, and that they will be contactable if there is an aspect of their service you’re not happy with. Whatever you do, don’t feel nervous asking a potential cleaner these questions. Professionals will expect it as they understand the trust you will be placing in them to take care of your home.